Pictured below is the right side of a dog’s mouth. During her annual exam, I noticed an abnormality on her upper fourth premolar called a slab fracture. Part of the enamel had fractured away from the rest of the tooth exposing the pulp cavity. The gingival tissue is still attached which holds it in place. With the nerves exposed, the tooth was painful. It was also infected. The tooth was removed and now this dog is pain free. Please study the picture then answer the following questions: What is this fracture called? What causes this type of injury to occur? Hard toys such as Nylabones. The gumabones from the same company are softer. 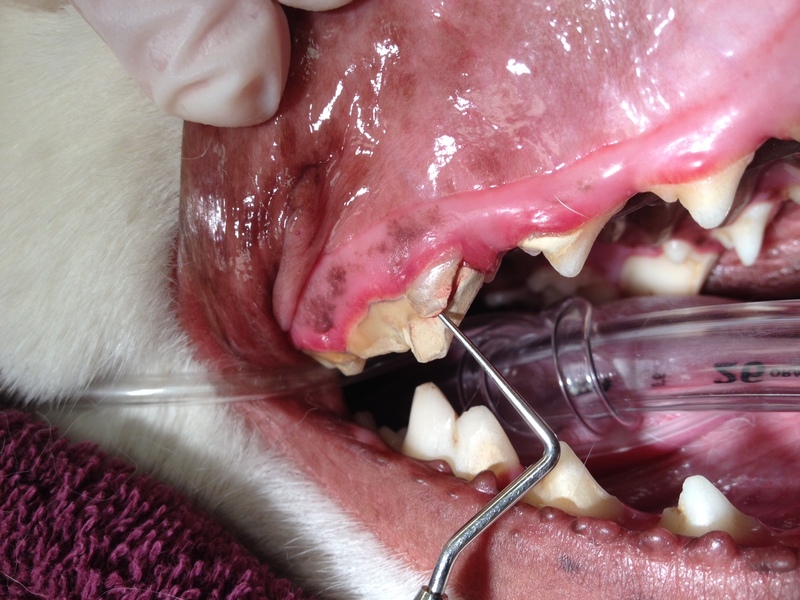 When deciding what to let your dog chew on, remember the advice given by the veterinary dentist, Dr. Steve Holmstrom. He discourages people from giving their dogs anything that doesn’t bend or break easily, anything that makes you grimace at the thought of chewing it yourself and anything that would hurt if it hit your kneecap. Dr. Nelson's Veterinary Blog, Proudly powered by WordPress.